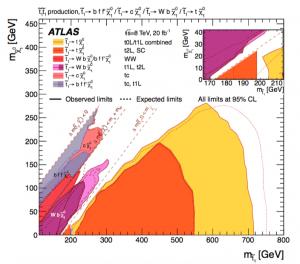 Tags: Accelerator Science ( 835 ), CERN LHC ( 232 ), Missing transverse energy (MET), particlebites, What Happens When Energy Goes Missing? 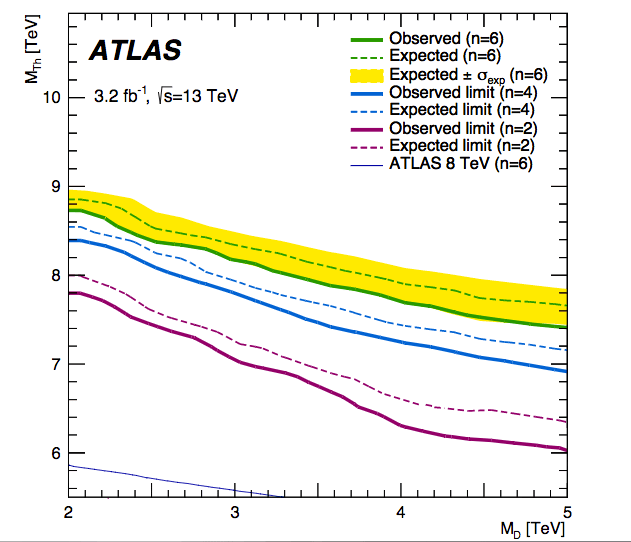 The ATLAS experiment recently released a note detailing the nature and performance of algorithms designed to calculate what is perhaps the most difficult quantity in any LHC event: missing transverse energy. Figure 2: ATLAS event display showing MET balancing two jets. Missing transverse energy (MET) is so difficult because by its very nature, it is missing, thus making it unobservable in the detector. So where does this missing energy come from, and why do we even need to reconstruct it? The LHC accelerates protons towards one another on the same axis, so that they collide head on. Therefore, the incoming partons have net momentum along the direction of the beamline, but no net momentum in the transverse direction (see Figure 1). MET is then defined as the negative vectorial sum (in the transverse plane) of all recorded particles. Any nonzero MET indicates a particle that escaped the detector. This escaping particle could be a regular Standard Model neutrino, or something much more exotic, such as the lightest supersymmetric particle or a dark matter candidate. Figure 3: Distribution of the sum of missing energy in the calorimeter soft term (“real MET”) shown in Z to μμ data and Monte Carlo events. Figure 4: Distribution of the sum of missing energy in the calorimeter soft term (“fake MET”) shown in W to eν data and Monte Carlo events. Figure 5: Resolution obtained from the combined distribution of MET(x) and MET(y) for five algorithms as a function of NPV in 0-jet Z to μμ data. 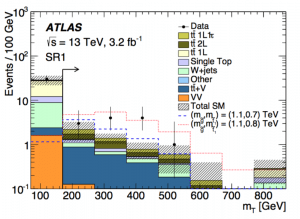 As the High Luminosity LHC looms larger and larger, the issue of MET reconstruction will become a hot topic in the ATLAS collaboration. In particular, the HLLHC will be a very high pile up environment, and many new pile up subtraction studies are underway. Additionally, there is no lack of exciting theories predicting new particles in Run 3 that are invisible to the detector. As long as these hypothetical invisible particles are being discussed, the MET teams will be working hard to catch them, so we can safely expect some innovation of these methods in the next few years. Like X-rays shining through your body can inform you about your health, the cosmic microwave background (CMB) shining through galaxy clusters can tell us about the universe we live in. When light from the CMB is distorted by the high energy electrons present in galaxy clusters, it’s called the Sunyaev-Zel’dovich effect. 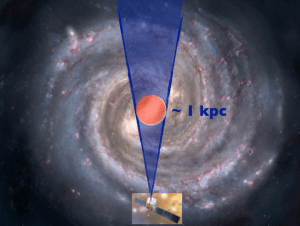 A new 4.1σ measurement of the kinematic Sunyaev-Zel’dovich (kSZ) signal has been made from the most recent Atacama Cosmology Telescope (ACT) cosmic microwave background (CMB) maps and galaxy data from the Baryon Oscillation Spectroscopic Survey (BOSS). With steps forward like this one, the kinematic Sunyaev-Zel’dovich signal could become a probe of cosmology, astrophysics and particle physics alike. 1. What is a jet? Jets are highly collimated collections of particles that are frequently observed in detectors. 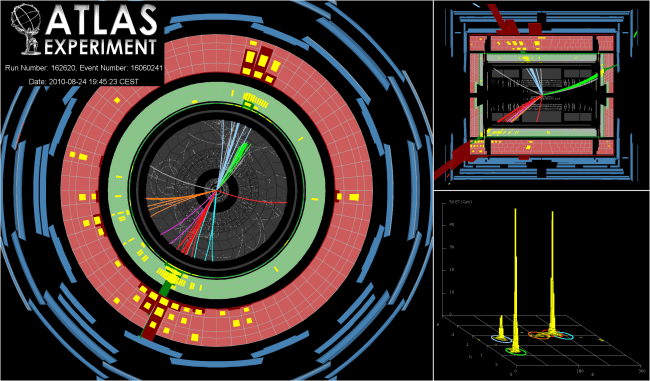 In visualizations of collisions in the ATLAS detector, one can often identify jets by eye. 2. Why do jets exist? Jets are a fundamental prediction of Quantum Field Theories like Quantum Chromodynamics (QCD). One common process studied in field theory textbooks is electron–positron annihilation into a pair of quarks, e+e– → q q. In order to calculate the cross-section of this process, it turns out that one has to consider the possibility that additional gluons are produced along with the qq. 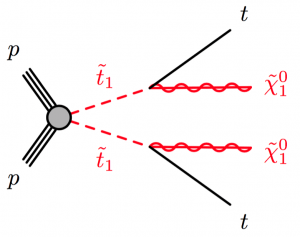 Since no detector has infinite resolution, it’s always possible that there are gluons that go unobserved by your detector. This could be because they are incredibly soft (low energy) or because they travel almost exactly collinear to the q or q itself. In this region of momenta, the cross-section gets very large and the process favors the creation of this extra radiation. Since these gluons carry color/anti-color, they begin to hadronize and decay so as to become stable, colorless states. When the q, q have high momenta, the zoo of particles that are formed from the hadronization all have momenta that are clustered around the direction of the original q,q and form a cone shape in the detector…thus a jet is born! The details of exactly how hadronization works is where theory can get a little hazy. At the energy and distance scales where quarks/gluons start to hadronize, perturbation theory breaks down making many of our usual calculational tools useless. This, of course, makes the realm of hadronization—often referred to as parton fragmentation in the literature—a hot topic in QCD research. The first recorded gravitational wave event, GW150914, was likely a merger of two black holes which took place more than one billion light years from the Earth. 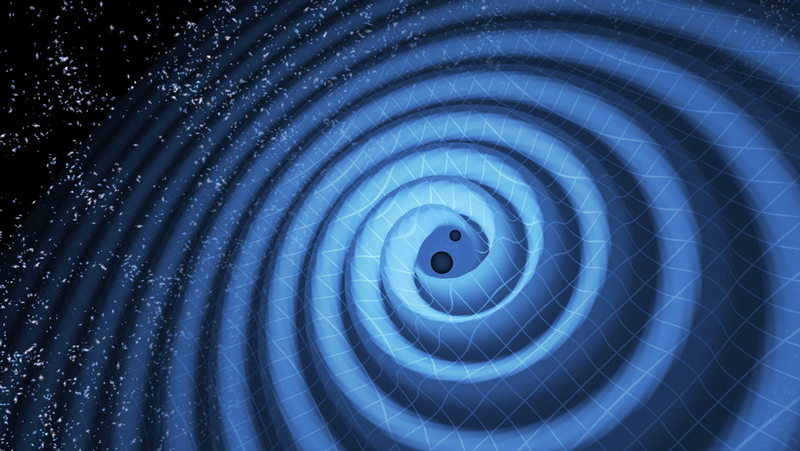 The event’s name marks the day it was observed by the Advanced Laser Interferometer Gravitational-wave Observatory (LIGO), September 14th, 2015. LIGO detections are named “GW” for “gravitational wave,” followed by the observation date in YYMMDD format. The second event, GW151226 (December 26th, 2015) was likely another merger of two black holes, having 8 and 14 times the mass of the sun, taking place 1.4 billion light years away from Earth. The following computer simulation from LIGO depicts what the collision of two black holes would look like if we could get close enough to the merger. It was created by solving equations from Albert Einstein’s general theory of relativity using the LIGO data. (Source: LIGO Lab Caltech : MIT). A third gravitational wave event candidate, LVT151012, a possible black hole merger which occurred on October 12th, 2015, did not reach the same detection significance a the aforementioned events, but still has a >50% chance of astrophysical origin. LIGO candidates are named differently than detections. The names start with “LVT” for “LIGO-Virgo Trigger,” but are followed by the observation date in the same YYMMDD format. The different name indicates that the event was not significant enough to be called a gravitational wave. The center of the galaxy is brighter than astrophysicists expected. Could this be the result of the self-annihilation of dark matter? 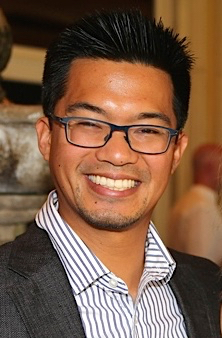 Chris Karwin, a graduate student from the University of California, Irvine presents the Fermi collaboration’s analysis. 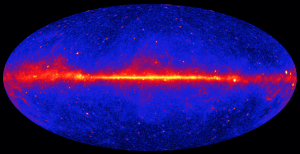 Like other telescopes, the Fermi Gamma-Ray Space Telescope is a satellite that scans the sky collecting light. Unlike many telescopes, it searches for very high energy light: gamma-rays. The satellite’s main component is the Large Area Telescope (LAT). In 2009, researchers noticed that there appeared to be an excess of gamma-rays coming from the galactic center. This excess is found by making a model of the known astrophysical gamma-ray sources and then comparing it to the data. The distribution of dark matter in space. The gamma rays coming from dark matter annihilation should follow this distribution, or spatial morphology. The particles to which dark matter directly annihilates. This gives a prediction for the expected energy spectrum of the gamma-rays. Although a dark matter interpretation of the excess is a very exciting scenario that would tell us new things about particle physics, there are also other possible astrophysical explanations. For example, many physicists argue that the excess may be due to an unresolved population of milli-second pulsars. Another possible explanation is that it is simply due to the mis-modeling of the background. Regardless of the physical interpretation, the primary objective of the Fermi analysis is to characterize the excess. The main systematic uncertainty of the experiment is our limited understanding of the backgrounds: the gamma rays produced by known astrophysical sources. In order to include this uncertainty in the analysis, four different background models are constructed. Although these models are methodically chosen so as to account for our lack of understanding, it should be noted that they do not necessarily span the entire range of possible error. For each of the background models, a gamma-ray excess is found. 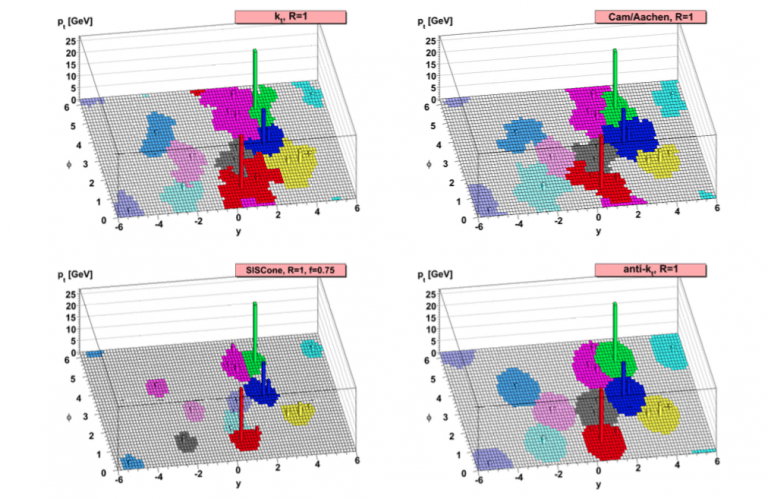 With the objective of characterizing the excess, additional components are then added to the model. Among the different components tested, it is found that the fit is most improved when dark matter is added. This is an indication that the signal may be coming from dark matter annihilation. This analysis is interested in the gamma rays coming from the galactic center. However, when looking towards the galactic center the telescope detects all of the gamma-rays coming from both the foreground and the background. The main challenge is to accurately model the gamma-rays coming from known astrophysical sources. Schematic of the experiment. We are interested in gamma-rays coming from the galactic center, represented by the red circle. However, the LAT detects all of the gamma-rays coming from the foreground and background, represented by the blue region. The main challenge is to accurately model the gamma-rays coming from known astrophysical sources. Image adapted from Universe Today. Parameters for these two types of sources are fit at the same time. One of the main uncertainties in the background is the cosmic ray source distribution. This is the number of cosmic ray sources as a function of distance from the center of the galaxy. It is believed that cosmic rays come from supernovae. However, the source distribution of supernova remnants is not well determined. Therefore, other tracers must be used. In this context a tracer refers to a measurement that can be made to infer the distribution of supernova remnants. This analysis uses both the distribution of OB stars and the distribution of pulsars as tracers. The former refers to OB associations, which are regions of O-type and B-type stars. These hot massive stars are progenitors of supernovae. In contrast to these progenitors, the distribution of pulsars is also used since pulsars are the end state of supernovae. These two extremes serve to encompass the uncertainty in the cosmic ray source distribution, although, as mentioned earlier, this uncertainty is by no means bracketing. Two of the four background model variants come from these distributions. An overview of the analysis chain. In general there are two types of sources: point sources and diffuse source. The diffuse sources are due to the interaction of cosmic rays with interstellar gas and radiation fields. Spectral parameters for the diffuse sources are fit concurrently with the point sources using a likelihood fit. The question mark represents the possibility of an additional component possibly missing from the model, such as dark matter. 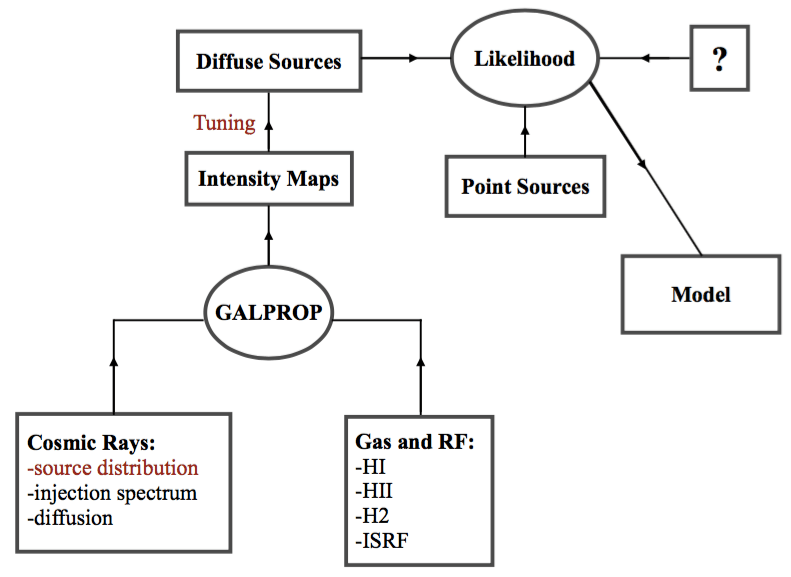 The information pertaining to the cosmic rays, gas, and radiation fields is input into a propagation code called GALPROP. This produces an all-sky gamma-ray intensity map for each of the physical processes that produce gamma-rays. These processes include the production of neutral pions due to the interaction of cosmic ray protons with the interstellar gas, which quickly decay into gamma-rays, cosmic ray electrons up-scattering low-energy photons of the radiation field via inverse Compton, and cosmic ray electrons interacting with the gas producing gamma-rays via Bremsstrahlung radiation. The maps of all the processes are then tuned to the data. In general, tuning is a procedure by which the background models are optimized for the particular data set being used. This is done using a likelihood analysis. There are two different tuning procedures used for this analysis. One tunes the normalization of the maps, and the other tunes both the normalization and the extra degrees of freedom related to the gas emission interior to the solar circle. These two tuning procedures, performed for the the two cosmic ray source models, make up the four different background models. Point source models are then determined for each background model, and the spectral parameters for both diffuse sources and point sources are simultaneously fit using a likelihood analysis. In the plot of the best fit dark matter spectra for the four background models, the hatching of each curve corresponds to the statistical uncertainty of the fit. The systematic uncertainty can be interpreted as the region enclosed by the four curves. Results from other analyses of the galactic center are overlaid on the plot. This result shows that the galactic center analysis performed by the Fermi collaboration allows a broad range of possible dark matter spectra. 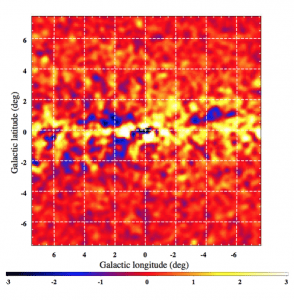 The Fermi analysis has shown that within systematic uncertainties a gamma-ray excess coming from the galactic center is detected. In order to try to explain this excess additional components were added to the model. Among the additional components tested it was found that the fit is most improved with that addition of a dark matter component. However, this does not establish that a dark matter signal has been detected. There is still a good chance that the excess can be due to something else, such as an unresolved population of millisecond pulsars or mis-modeling of the background. Further work must be done to better understand the background and better characterize the excess. 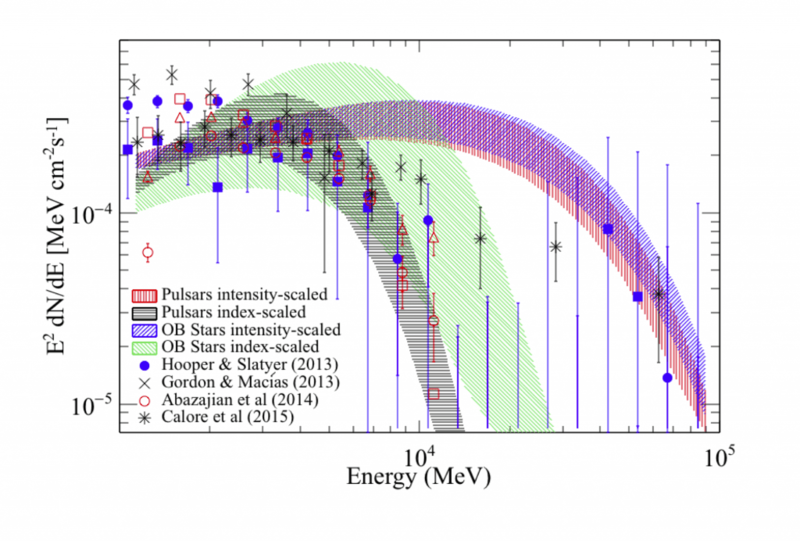 Nevertheless, it remains an exciting prospect that the gamma-ray excess could be a signal of dark matter.